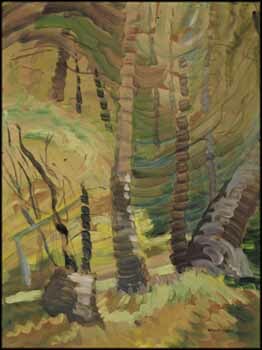 This animated inner forest work, which appears to be swept by gusts of energy, is related to what author Doris Shadbolt refers to as Emily Carr's "light-in-the-woods theme." Two similar works - Dancing Sunlight, in the McMichael Canadian Art Collection, and Sombreness Sunlight, in the collection of the BC Archives - possess this very distinctive segmentation of tree trunks into rings, formed by short strokes of paint. This stylization recalls the inner growth rings in trees, which indicate their span of years. So free is Carr's brushwork that these strokes of paint actually disconnect, showing space in between, as if the trunks are on the verge of breaking free of their material form. Furthering this sense of dematerialization, thin wavy branches fragment on the left, and the stump below them appears to hover. Into this forest from the unseen sky comes sunlight, glowing yellow and white as it strikes the vegetation and brings the earth to new life. Spring No. 3 is an immensely free and expressionist painting, imbued with a sense of the joyousness of spring.